This is by far the most common den theme, not just in America, but all over the globe. Yes, even Japan with their sake lounges. The awesome thing about that is the unbelievably vast range of specialty products. Our aim is to trawl through the ranges and give you ideas for creating the ultimate bar cave. Grab a pen & pad, crack open a beer, and get inspired. This is the core item of the theme. Without it, you'll just be drinking in a standard room, and what's the fun in that? Keep in mind that two subcategories fall under it: 1) the compact mini bar, and 2) the full-fledged setup you see in traditional pubs. To cater to the majority we will focus on the former. Have you previously written off this idea because you thought you needed to have a bench half the length of your house? Well, this should help you reconsider. This piece is of a minimalistic design but doesn’t sacrifice space. The rectangular shape means you can slot it next to some furniture or up against a wall. The two glass shelves allow you to showcase your liquor, store your mixing equipment, and hang your glassware. You have a choice of three colors: Cappuccino (pictured above), Black, or White - each with a nice gloss finish. Note about the shippers: Our test unit came with a massive amount of wrap protection. A huge bonus since furniture is notorious for being delivered chipped, scratched or flat out broken. Even if you’re trialing this den theme, since nothing is bolted down or permanent, you can easily move it out if you change your mind. Enjoy the classy things in life without the headaches. As great as the previous item is, you may prefer something more mobile and compact. With this mini setup, you can find a home for it in your cave, then roll it outside for an epic BBQ. Foldable top. Doubling the table space gives you the ability to get creative with your drink concoctions while still having a place for snacks. Tip: When putting it together, keep tightening the main pieces until you have all four screws lined up - making the subsequent steps a thousand times easier. People thought standing office desks were innovative. But what came before them? The humble pub table, of course. Coffee tables still have their place in the cave, but we see pub tables as an essential item. What better way to get the pub vibe in your own home? Close to 40 inches tall, this obsidian-style piece is a must-have for any bar room (or any home office for that matter). The whole base is metal, the top is medium-density fibreboard, and both are coated with midnight black paint. With the base having a 17.5-inch diameter, you can be sure that it will stay planted in the midst of pushers, leaners, and fallers. The most important feature in a pub table as there’s nothing worse than one falling at the faintest of touches spilling beers on your electronics. True nightmare fuel. Assembly is literally a matter of screwing on the top, meaning you can take it apart and store it away when necessary. Standing all night is sure to bring the pain. Thankfully, a stool and table go together like cider and summer. Here are a few which are made from quality material and have the looks to go with it. Whether you have an old wood bench and need a matching stool to complete your set, or you’re just a fan of rusticism, these challiman items are worth looking into. Either way, make sure you know the height of your table prior to choosing the stool style since one is 5.5” taller than the other. The seat is made from a wood-like material with a nice veneer coating and is designed to take a beating while still retaining its rustic appeal. Tip: Put the few dollars saved stools into a better recliner. The vast majority of your time will be off your stools, so memory foam padding and fancy levers are often an overkill. In most cases we’d advise going for more economical stools and putting the extra money into a premium recliner, however, we can’t deny the joy great stools bring to a bar. These ultra-modern seats are all about comfort and aesthetics. They have levers for adjusting height, geometric padding (with curved sides), support for your back, 360-degree swivel ability, mirror-like chrome base with an appropriately sized foot rest, and rubber protection underneath. Leather can also come in bright red. To avoid duplication, check out our dedicated page of cool bar sign ideas. It's safe to stay that most action will happen in the afternoon. When the sun goes down you need artificial light to fill the void. Not just any light, though. It’s important to get ones which add to the ambiance of your man cave. See Current Price Small rooms can get away with one or two lights haphazardly installed. When you go a little bigger, say, the size of an average lounge, positioning lights become a bit more important. With these swivel light fixtures, you’re able to move them to the angles which best highlight your man cave bar. Point one to the entrance; one to the bench; one above the coffee table, and watch it everything become more vibrant, deliberate, and inviting. As much as that sounds like an exaggeration, a before and after snap will convince you otherwise. Installation services add a hefty chunk to the overall bill so if you’re hesitant, watch some instructional videos before going that route. See Current Price These LED strips are nearly 33 feet long and have 300 lights! Including plain white, they can shine a total of 16 vibrant colors. This is your opportunity to get creative. Glue them to the outskirts of your bench, under your entertainment unit, or around your wall art. Change the vibe with a flick of a switch. If you find yourself pulling a beer tap and filling your friend’s glass, you know you’ve made it in this world (that, or you jumped over the counter at your local establishment). Before that moment, there are a few questions to answer: Should I get everything from one place? How many taps is needed for a home setup? Etc. We’re here to help. A kegerator unit is definitely not for everyone. They are costly, bulky, and if you’re not careful, noisy. Having said that, when I go into a den and spot a kegerator calling my name, a stream of excitement goes through me and completely forget any downside to having one. For those who can relate, I suggest EdgeStar’s complete kit to get you started. It’s not as big as some of the others, it’s ultra quiet, but yet still an awesome piece of equipment. Something I really like is the gas tank being on the outside. The ones which have them on the inside advertise the abundance of space without disclosing the fact that half of it will be for the gas tank. One-quarter kegs are often all they can fit. Thanks to the quality of the overall built, except to have your beer fresh up to four months after tapping the keg. One benefit of a home pub is being able to walk around the counter, put your head under the tap, and pull the lever. Side note: it's the male equivalent of your wife going on a shopping spree. As awesome as that sounds, from experience, the novelty quickly wears off. Not to worry, these glassware ideas are a worthy alternative. See Current Price Wine drinkers pop open their best wine in times of celebration; others splash out on fancy cuisines. Beer drinkers, on the other hand, forgo drinking from the bottle/can and use a glass. When I grab my craft beer glasses you know it’s a special occasion. The ‘Made in USA’ stamp means that you can expect quality. There were no defects, scratches, dimples or deformities in my set, nor in the sets I’ve sent out to fellow readers of this site. See Current Price I’ve always been fascinated by Norse mythology, so when I discovered people made Viking tankards, I was hooked. I went through a few different brands before stumbling on Jomsborg - they have been the only novelty drinkware brand which captures the essence of that time. The 20-ounce mug is handcrafted (and polished) to be in the shape of a horn. As such, each one has a unique pattern and color variation. The lack of defects goes to show the care and precision that goes into manufacturing them. Note: We advise hand washing it first thing to get rid of dust/material that sneaked its way into the packaging. Also, avoid pouring hot liquid in it. Without storm drains, roads are prone to flooding. Without a bin, rubbish begins to accumulate. Likewise, a home bar without a dedicated place to dispose of bottle caps will soon find them on the coffee table, between the sofa, and on the speakers. Yes, having a container with “Feed Me Bottle Caps” scribbled across it will reduce that problem, it still means relying on people to actually do it. Take away that unnecessary step by getting this opener/catcher combo! Crack open a bottle and the cleanup is done. Hidden magnets pull them out of the way into a tray. Such a simple yet brilliant idea. Tip: Mount it in a location where there isn’t much foot traffic. Accidentally walking into one is right up there with stepping on a LEGO brick. Electronics encompasses a range of items, so to keep within the scope of the topic we are only talking about the common ones found in a den. Namely sound systems and televisions (vital for man cave sports bars). Size. No matter if you're right up close or on the opposite side of your man cave, the 50-inch screen provides a great viewing experience. Quality. Native 120Hz refresh rate (double that of the previous generation). LED-backlit screen providing a better dynamic contrast in a slimmer package, all the while using less power. 1080p HD resolution. Sit it on a table or have it wall mounted (wall mount needs to be purchased separately). Smart technology. Flick through over 3000 streams, hook up a console or cast your device. Control it all via the remote or your phone (Roku app). And just like the previous version, enjoy the viewing it from any angle without worrying about screen glare. See Current Price Nothing fancy, nothing over the top, just quality sound to fill your room at a reasonable price. One thing to note is the magnetic shielding in each piece - ensuring they don’t distort/damage electronics close by. And depending on the size of your cave, 16 American wire gauge would be a worthy supplementary purchase. With the fundamental items out the way, here are some miscellaneous ideas to create the ultimate place to drink, party, and live. Wayfair (and a handful of other manufacturers) have a long track record of stocking excellent tables, with this one being the ideal mix of affordability, quality, size, and clear assembly instructions. 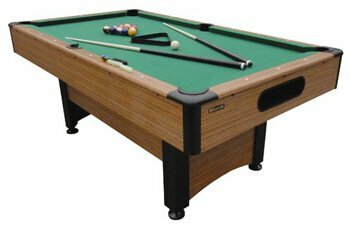 Also comes with two pool cues, chalk, balls, and a triangle so you can jump straight into the action the moment it’s assembled! If there’s one item to thorough research on, it’s this. Know what to look for and what to avoid before taking the plunge. Darts has exploded in popularity as of late. The iconic bar game can now be seen on TV with world-class players (each with a unique persona/personality), thousands of fans screaming their names (who simultaneously shout “one hundred and eighty!”), and companies pouring advertising dollars into it all. Join the fun with an official tournament dartboard made to last years. This one, in particular, uses self-healing & durable sisal bristles which are painstakingly woven to extend its life. Fire a shot, pull it out, and have it literally close up before your eyes. Winmau lets you remove the outer metal ring from the board. Why? So you can regularly rotate it around, ensuring it receives an even distribution of dart hits (I’m looking at you, number 20). Avoid soaking the dartboard in water, or even splotching water on it. There’s a common misconception that doing so helps it heal, where in reality it does the exact opposite. Note: As for the actual darts, you can’t go wrong with the top brands such as Harrows, Winmau, Bottelsen, and even Puma. See Current Price Home brewing is such a rewarding and worthwhile hobby. Just like how running every morning does wonders for your fitness levels, it teaches you the process of brewing beer, how the different flavor profiles are achieved, and, best of all, gallons of beer to enjoy by the end of it! See Current Price Being just as much a home decor item as reading material, The Beer Book is the perfect thing to tie your man-room together and to express yourself as a beer aficionado. Although this one covers multiple countries and continents, it’s worth also picking up one which is about your specific region - providing a deeper dive into your local breweries, beer history, flavor profiles, and more.